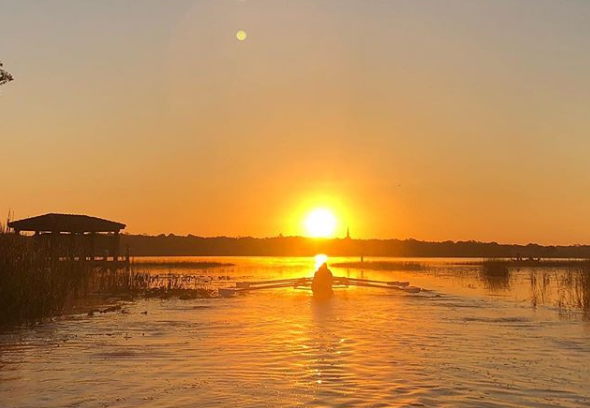 Over spring break, the Trinity College women’s crew team travelled to Orlando, Florida for their annual training trip for the second year in a row. The team stayed at Camp Ithiel, and rowed every day at Lake Down, where Shaquille O’Neil has a summer home. The week culminated in a scrimmage with Northeastern State University, where Heather Barney coached the women’s team prior to her role at Trinity, and an inter-team scrimmage with mixed 1V, 2V, and 3V boats. The scrimmage against NSU consisted of many short pieces between NSU 1V and 2V and Trinity’s 1V, 2V, and 3V, with the results extremely close between the leading boats of both NSU and Trinity. Throughout the week the team did a variety of drills and practices to prepare themselves for the scrimmage. Aside from practices, the team got the chance to engage in valuable team-building. They frequently went out to dinner, performed class skits, ran, and participated in team building activities. After a very early morning practice on Saturday, they concluded their last day of spring training by spending the remainder of the day on Cocoa Beach. Some highlights of the week included seeing an otter, house hunting, petting (and eating) alligators, jumping off the boats into the lake, jamming out in the vans to and from practice, and having a team campfire. With the flight back to Hartford delayed by three hours, the team stayed on the grind and was able to get a head start on homework in the airport. After a long day of travel and waiting for flights, they finally arrived back on campus just around 3 a.m. Although the team didn’t go to Disney World, the hard work they put in will definitely help them achieve a high ranking in upcoming races, and hopefully earn them a spot in the NCAA Championships at the end of May. The NSU scrimmage was a great way to get the team prepared for the larger competition ahead. The first regatta that the team has is on March 30 on the Charles River in Boston against MIT and Bates, both of which have very fast crews and a lot of positive potential in the upcoming season. Bates was the NCAA DIII champion for rowing last year, so no doubt they have a very tough match ahead for the very first race of the season. However, if this spring training trip has demonstrated anything, it is that the team is more than ready to meet the challenge ahead. 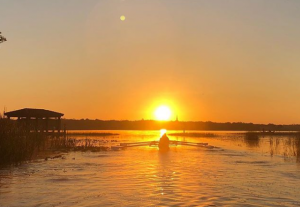 In upcoming regattas, the team will also compete against Simmons, MIT, Bates, Tufts, Coast Guard, Worcester Polytechnic Institute, Colby College, Connecticut College, Middlebury College, and other NESCAC schools. We wish them the best of luck for their upcoming regatta this weekend.